When I was a kid in Germany, my family would from time to time celebrate occasions with what we called a "schopffest". Literally translated, "schopffest" means "shed fest". Basically, a party in a shed. Living on a farm, there are plenty of large spaces that can be repurposed as party rooms. 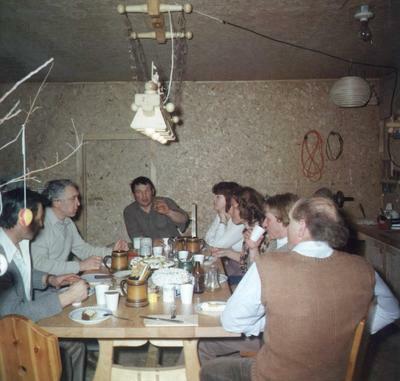 And the informal surroundings give it the informality of a barbecue with the coziness of a dinner party. 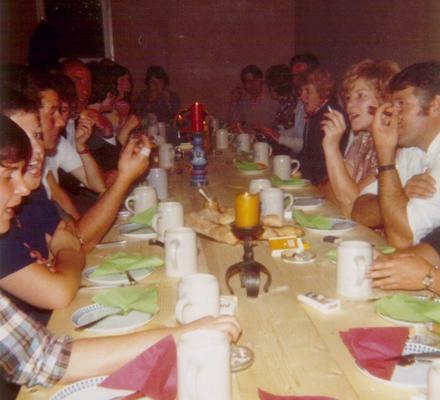 The photos above are from a party in my dad's workshop back in Germany. This being the mid 70s, everybody smoked. 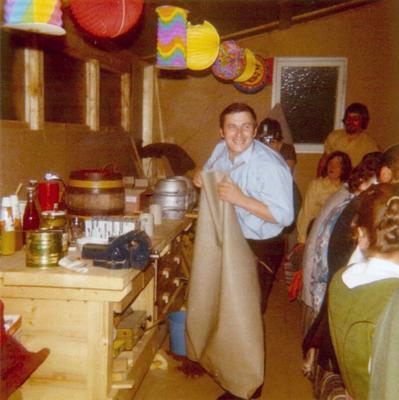 At left - celebrating Easter in my dad's old workshop in the early 1980s. 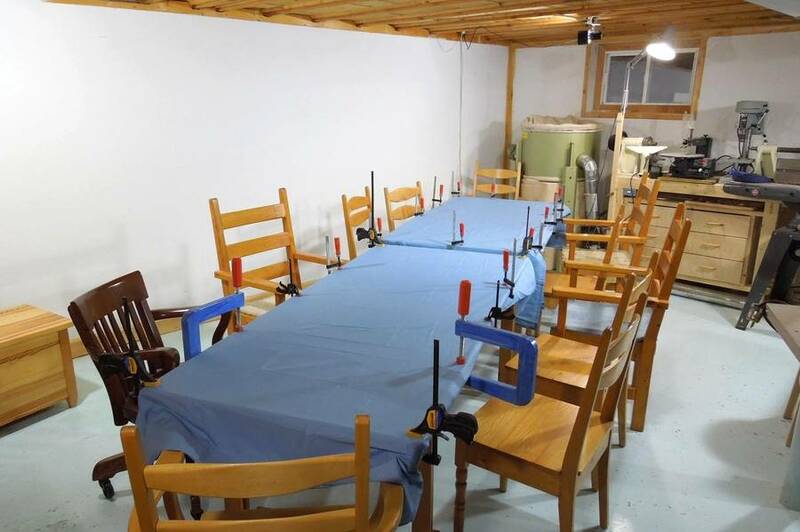 So I consider it well established that a workshop can make a good party room. For a dinner party, I worked out that I'd need a table about 3.5 meters (12 feet) long to comfortably seat everybody. Other than the living room, the only space in my house big enough was my basement workshop. 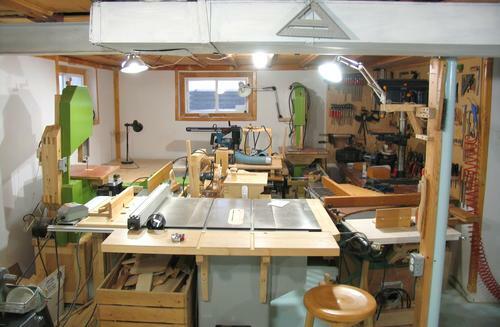 With most of my machines on wheels, I managed to push two bandsaws, a 6" and a 12" jointer, the horizontal boring machine, slot mortiser, thickness planer, pantorouter, and radial arm saw all into the space between the table saw and workbenches. 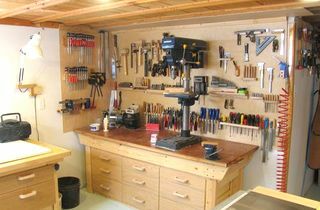 I then pushed my other table saw as far into that corner as it would go as well. It was like one of those puzzle games where you have to shift some blocks through a small opening. 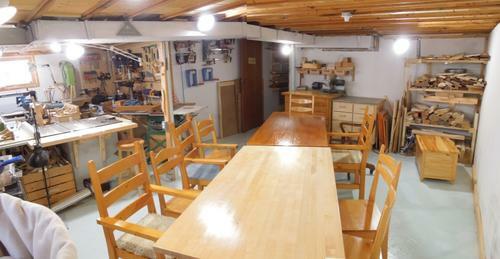 With the back of the shop mostly cleared out, I set up two long tables end to end. Actually, a table, and an old desk top on two sawhorses. Had I not torn out the old closet two years earlier, there would not have been enough room for the tables. I bought two cheap bed sheets to use as table cloths - only $7 each! But once unfolded, they had some creases from how they were packed. So I stretched the creases a bit by pulling on the sheets and clamping them to the edges of the tables. I left them like that for a day. When the guests arrived, some people remarked that it was a bit cool down there. It was - just that I'd never noticed because when I'm in the shop, I'm usually doing stuff, and wearing a jacket to keep the dust off me. 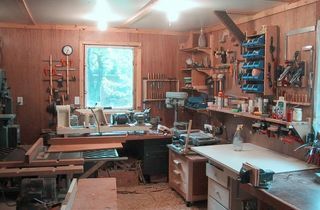 There's no heating registers in the workshop - a good thing mostly - keeps the dust from circulating. But at some point, the ducts had been cleaned, and so there was a big hole in the duct that had been covered with another piece of sheet metal. No problem, I opened up that hole and turned up the furnace a bit, and we had heat! People are always a bit curious about some of my contraptions. So I had marble machine 2.1 set up, and I also showed off my pen shaking contraption. I couldn't show off the machines, with them all crammed together. My friend Darcy took some video of me explaining a bit about the marble machine and the pen shaking contraption. Funny, it's so much easier to be both enthusiastic and coherent at the same time when you aren't trying to make a video! Good food, good company. What could be better! As the evening progressed, talk came to some YouTube videos, so pulled out a laptop computer. 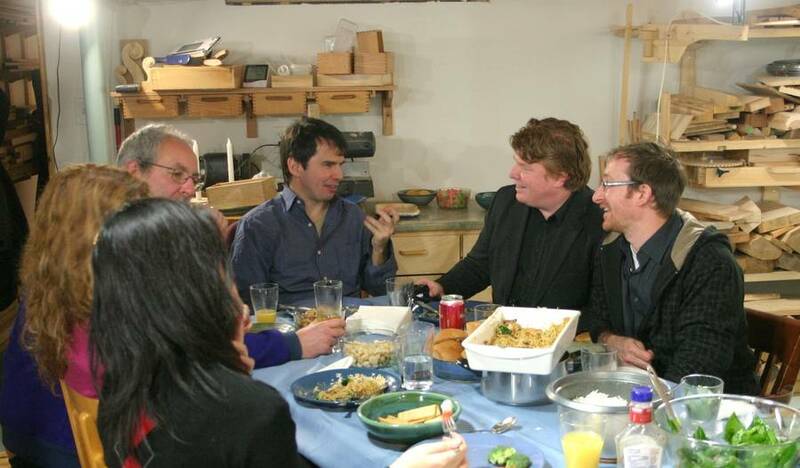 Some of the guests had by this time relocated into my living room, where the conversation wasn't quite as nerdy. So the workshop is definitely usable as a party room, though it was a lot of work to get it into that state. Next time, I won't clean the machines - with them all crammed together and inaccessible, it doesn't matter if they are full of dust.